Scientists had plenty of reasons to celebrate in 2008. The Large Hadron Collider fired up for the first time, a temple of science opened its doors, several companies promised cheap genome sequencing and President-elect Obama hired a fantastic team of science advisers. After decades of work, researchers made rat stem cells, built the first memristor and watched a language evolve like an organism. But none of those accomplishments impressed us as much as the breakthroughs on this list. In 2007, scientists learned how to reprogram skin cells into stem cells, without cloning or destroying embryos. It seemed too good to be true, and it was. The tissues grown from those cells had a nasty tendency to become cancerous, which made them useless for regenerative medicine — the science of building and fixing body parts. In 2008, several research groups figured out what was going wrong and solved the problem. Researchers had used an an adenovirus to slip four genes into each cell, but the microbe was causing lots of collateral damage. By switching to a different kind of virus, scientists at The Whitehead Institute and Massachusetts General Hospital were able to make the procedure safe. Companies like Nanosolar and Solyndra slashed the cost of solar energy, but scientists are still looking for a clean way to store all that juice. Daniel Nocera of MIT has an elegant solution: Use electricity to break water into hydrogen and oxygen, store it in separate tanks, then recombine the gases in a fuel cell when you need power. Anyone can do this. Just hook a 9-volt battery to electrodes and dunk them into a jar of water. The problem is that it takes a lot of energy to do this. If you want to fill tanks with those gases, and use them to run a fuel cell, you'll need to do it very efficiently. Nocera, and his team at MIT, found a catalyst that makes the task of splitting H2O remarkably easy. It could store the energy harvested by solar cells and wind farms. The numbers on Wall Street were dismal in 2008, but even more frightening figures came from Antarctica. When scientists traveled to the frozen continent and analyzed ancient pockets of air trapped deep in the ice, they learned that our atmosphere has 28 percent more carbon dioxide now than at any other time in the past 800,000 years. Thomas Stocker of the University of Bern provided some of the most compelling evidence to date that we are irreversibly warming our planet. He showed that the rise and fall of CO2 concentrations in the atmosphere matched the melting and thawing of the polar ice caps, and identified a period in which the greenhouse gas was at an all time low. Another team, led by Jerome Chappellaz of Joseph Fourier University in Grenoble, drew the same conclusions by measuring methane levels in ice core. They remarked that another greenhouse gas, CH4, has not risen above 800 parts per billion in the past 650 millenia, and currently it is at over twice that level. Scientists have been tinkering with carbon nanotubes for decades, and this year the work has paid off. Chinese scientists have used the nanotubes to make transparent audio speakers and sheets of paper stronger than steel. The speakers work by a thermoacoustic effect: They vibrate and make noise when heated by an electrical current. The scientists demonstrated in YouTube videos that their prototype could blast a scratchy but understandable version of the Moldovan pop song "Dragostea din tei" while it was taped to the side of a waving flag. Another team at Florida State University made paper that is far lighter and stronger than steel by pressing sheets of carbon nanotubes together. Those composite materials, developed by Ben Wang and his team, could make aircraft parts and body armor. In a perfect sheet of the material, all of the carbon nanotubes should be pointing in the same direction. Wang figured out how to align the tiny cylinders with magnetic fields. Thanks to that discovery, and other advances, buckypaper could be on the market within a year. For the first time, doctors sequenced the entire genome of a cancer patient, and also read the genetic code of her diseased cells. That allowed them to pinpoint the exact mutations responsible for the illness. In the short run, that data will give cancer researchers a much better understanding of the disease, but their real triumph is bringing the medical community a step closer to offering personalized health care. Cancer is hard to fight because nearly every case is different, and yet doctors use a somewhat one-size-fits-all approach to treating patients. As new medications like gene therapy and RNA interference become widespread, oncologists will be able to tailor treatments for patients because of what's wrong with their genetic code. In the meantime, some physicians are using simple genetic tests to predict which medications will work well on their patients. The latest generation of supercomputers can perform more than a quadrillion operations per second, and that remarkable capability will revolutionize the way scientists do research. It will allow them to identify meaningful patterns in unfathomably large mounds of data, and perform simulations with unprecedented accuracy. Meteorologists could know exactly where a hurricane will strike days before it makes landfall. Neuroscientists may be able to emulate a simple brain. So far, two machines have broken the petaflop barrier, and as more follow we'll see monumental advances in every field of science. Some people are remarkably resistant to HIV, and scientists have found two ways to give that immunity to others. In the first case, Berlin doctor Gero Huetter transplanted bone marrow from a virus-resistant donor to a man who had both HIV and leukemia. By doing that, he cured both diseases with one treatment. It sounds great, but Huetter had to kill off his patient's immune system with drugs and radiation before replacing it with a better one. Because that tactic is tremendously harsh and risky, it is unlikely that the miraculous procedure will catch on. Instead, his victory provided solid evidence that gene editing might offer a viable solution. Every virus-resistant person has two mutant copies of a gene called CCR5, and a new biotech tool called zinc finger nucleases can give anyone that mutation. Instead of transferring bone marrow from another person, doctors could take a few cells from a patient, modify them to be HIV-resistant and then put them back in. This has been a very big year for astrobiology. Several teams of researchers have found the building blocks of life outside our solar system and others have spotted dozens of planets that aren't much bigger than earth. When astronomers in France pointed the IRAM radio telescope at a region of the Milky Way filled with newborn stars, they found signs of a sugar molecule called glycolaldehyde. It is an ingredient of RNA, the substance that may have played a key role in the dawn of life. Until then, the organic chemical had only been spotted at the chaotic core of our galaxy. Using the Hubble telescope, another group of researchers found the first evidence of water and carbon dioxide on a planet outside our solar system. Thanks to stem cell research, people with failing organs may not need to wait for a donor or take harsh medications that prevent their immune systems from rejecting transplanted tissue. One of the greatest examples of regenerative medicine — the science of building or fixing body parts — took place this year, when doctors removed some cells from a 30-year-old woman with tuberculosis and used them to grow a new trachea, replacing a segment that was destroyed by the bacterium. They took stem cells from her bone marrow, layered them onto a decellularized trachea from a deceased donor, and surgically implanted it in the woman. Four months later, Claudia Castillo could breathe well and showed no signs of the side-effects that patients have when they receive an organ from someone else. After a seven-month journey through space, the Phoenix lander touched down on Martian soil, and soon after discovered ice. On May 31, two days after the lander's robotic arm went to work, its camera caught a glimpse of something shiny under the craft. 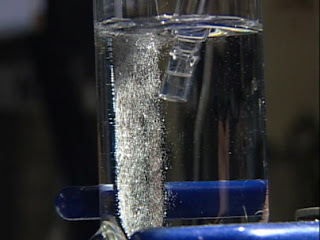 Lead researcher Peter Smith speculated that the landing rockets had blown a thin layer of soil away, exposing buried ice. The big announcement came on Jan. 19, after scientists compared two photos of a ditch called Dodo-Goldilocks. In the first image, several bright nuggets were visible, and four days later the chunks had disappeared. Taking the temperature and atmospheric pressure into account, the specks had to be ice that sublimated after being uncovered by the mechanical claw. The red planet may have an inhospitable climate, but at least it has water, and that will be tremendously useful when the first group of explorers lands there.